It seems to be the accepted truth that anyone with children must, by default, have pets too. No dogs, cats, fish, lizards, rats, rabbits, snakes, gerbils, geckos or guinea pigs cluttering up and stinking out our house. (Just Bloke and the kids cluttering up and stinking out our house).Weird huh? It’s not like it hasn’t been discussed. And often. Bloke and I both had dogs we adored while growing up, and have wavered many times over the years about getting one, but could never really agree. He doesn’t like small dogs and I don’t want a whopper. We both agreed if we did get one it would be a puppy from a rescue centre and be a mongrel, but then, what if the dog was unpredictable around kids? And what about the extra mouth to feed? And vet’s bills? And being able to go on holiday? Ultimately, the big “No” came because we thought it wouldn’t be fair on the dog. We both work and a puppy needs round-the-clock attention. Even though I’m a freelancer and often at home, sometimes I’m not, and that unpredictability is the issue. It might be fine, it might not. I’ve always felt that it wasn’t the right time. After all, we sometimes struggle to keep up with the demands of four small humans, without adding another being into the mix. We actually had a hamster, once upon-a-time, when Jed and Doug were about four and five. It was called ‘Outfit,’ and named after Dougie mis-heard the name of a cartoon hamster called “Elephant.” (Something to do with American accents). Despite all the promises, Outfit’s care, attention and cleaning out ended-up being my sole responsibility. Everyone else in the house seemed to lose all sense of smell and forgot that the poor little critter quite liked a tumble around the living-room in his plastic ball. And although the books claim hamsters only live a couple of years, Outfit seemed to last FOR EVER. Until, of course, he died. And then suddenly everyone behaved like they’d lost their best friend. Weeping went on for days. We had a solemn burial in the back garden where the overflowing compost heap now stands. After Outfit’s demise, we had two more children to distract everyone from getting pets. But for the past few years, the nagging has returned. Dougie is actually a little fearful of dogs, having been flattened by an over-amorous Bernese Mountain Dog when he was about seven, but still begs us for a dog he can care for and take for walks. Billy asks for a Real Dog every birthday and Christmas. Jed too promises he’ll care it and walk it, even if it’s December and raining. “And it’s not like it could make the house look any worse,” they plead. This weekend, Bonnie and I ended up at Bell Plantation garden centre in Towcester. If you’ve never been, it has an impressive poultry section. As well and loads of different hens and cockerels, it has rabbits and ducks and has recently added three pigs. (Bonnie decided they were called Peppa, George and Chloe, after the characters in her favourite TV show, but the store has yet to announce their names by a public vote). 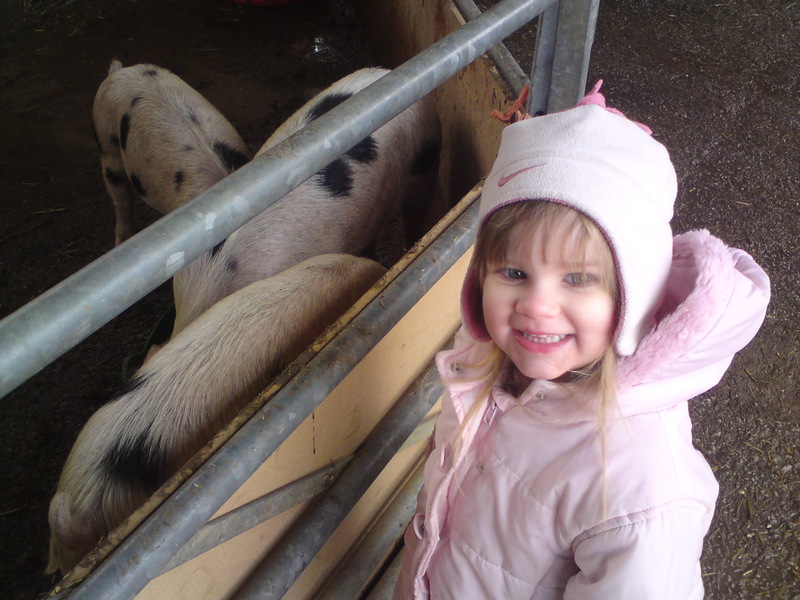 Bonnie was initially impressed by the pigs, but they were too busy eating to even look at her. 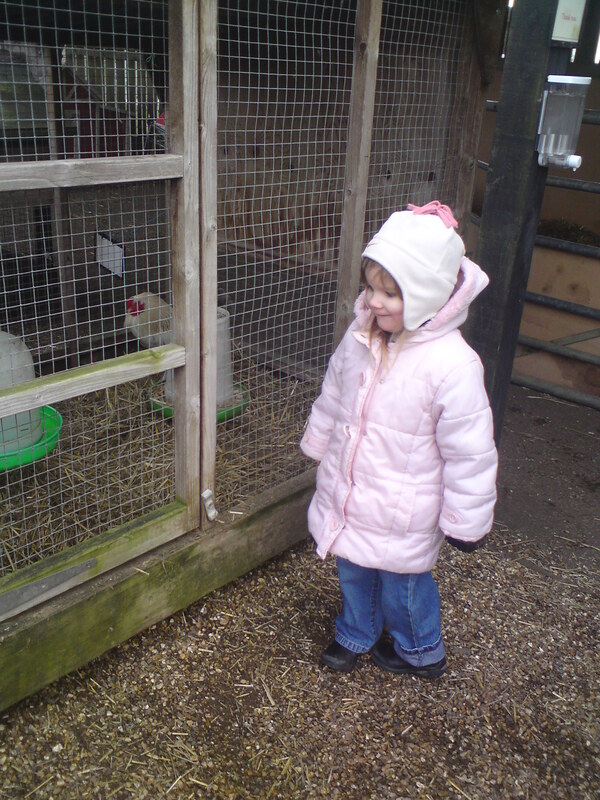 She was far more interested in the chickens. They did, predictably, cluck over her, coming to the front of the hen houses and not even nipping her when she disobeyed orders and stuck her digits through the wire. “Can we take hens home?” she asked, optimistically. I admit it, I wavered, despite the potential cost and smell. (I grew up in Devon, spent much of my childhood on farms and can officially confirm that chicken poo and pig poo are next in line behind humans for olfactory offensiveness). It does sound nice, doesn’t it, having fresh eggs from the garden? Hearing that gentle clucking? They are supposed to be ‘easy’ to keep and good with children? The hen-houses on sale look study and could fit in our small garden? Have I been mean by never letting my own children know the joy a family pet can bring? While a dog will continue to be the number one choice, it still appeals to me, keeping chickens, although the boys wouldn’t have anything to take for a walk and they don’t lend themselves to being house-trained or snuggling up on your lap.